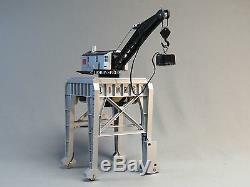 Lionel Steel Command Control Gantry Crane. The popular postwar Four-Action Magnet Crane has been upgraded to give you control over more crane actions than ever before! Just like the postwar original, Lionels newest gantry crane provides remote control of cab rotation, turning the magnet on and off, raising and lowering the hook, and manual control of the boom. Additionally for the first time ever you now can also move the entire gantry crane back and forth on your track layout! Equipped with Command Control, all these special features are user-controlled through any CAB-1, CAB-1L, or CAB-2 remote controller. CAB Command Controllable Features including:-Forward and backward trackside movement of entire crane unit-Crane cab rotation in either direction-Raising and lowering hook line-Electromagnet activation-Lighting control. CAB-2, CAB-1L, or CAB-1 remote controller is required. Command only-- no conventional control for this accessory. Special track section for gantry unit motion available from other manufacturers (not included). 13 x 5 x 5 1/8. 2016 Lionel Volume 2 Catalog. And receive our final invoice to pay. All items must be paid within 7 days. Value Added Authorized Lionel Dealer. The item "LIONEL STEEL COMMAND CONTROLLED GANTRY CRANE O GAUGE train mill 6-82022 NEW" is in sale since Friday, December 30, 2016. This item is in the category "Toys & Hobbies\Model Railroads & Trains\O Scale\Other O Scale".